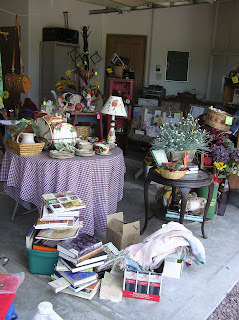 It’s been more than a week now since I started gathering my extraneous stuff to sell tomorrow. I’m having a garage sale. 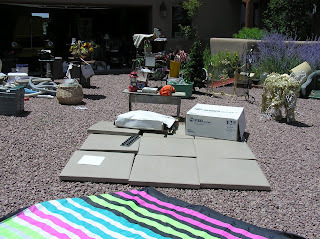 Today, I’m shocked and awed at the stuff saturation stuffing my garage and front yard. OMG! Before giving birth, my possessions were books, clothing and a cadre of animals (horses, goats, etc.). Then in 1974 came my first daughter and subsequent reels of 8mm film, boxes of Polaroids, mementos and more. 1976 brought my second daughter. By 1980 memory lane started to become a memory vault. The vault was fed with kindergarten art projects, YMCA crafts, school certificates, programs of school plays, piano certificates (“Dakota successfully completed Primary Piano,” meaning she could play the C scale), news clippings, scrap books, and more Polaroids and photos. When the girls’ birth-father died, I saved his stuff for them. His stuff? He was a geologist, so ask me about moving, and moving, and moving his boxes of rocks. I’ve done some editing, but I’m still saving the really good rocks for my grandson. Then I have all the gifts given to me by the girls for over 30+ years. I fear bad mamma-jamma if I rid myself of those. Grandson Quinlan will be a year-old next week. I’ve off-loaded boxes to his mother. Pretty soon she’ll be wondering how this stuff began accumulating to the point of ridiculous. Gotta run, calls are coming in about the advertised sale. Wish me luck, and if you are in the neighborhood, stop by and continue the process of your own stuff saturation.